Thank you for visiting the Americans Against Gun Violence website. I'm sure that you share the same emotions that I do - including grief, horror, and outrage - following the tragic mass shooting in Orlando, Florida in the early hours of the morning on Sunday, June 12. I hope that you also share my belief that we can - and must - stop the epidemic of gun violence that afflicts our country. The problem is, this statement was made by Senator Thomas Dodd almost 50 years ago, after the assassinations of Senator Robert F. Kennedy and Reverend Martin Luther King, Jr., in 1968. At the time of my writing this message, it appears that after the worst mass shooting in US history, Congress will not even be able to pass legislation to ban individuals on the terrorist watch list from buying guns or to require background checks prior to gun purchases at gun shows or over the internet. The founders of Americans Against Gun Violence believe that it is long past time that we should heed Senator Dodd's words and enact gun control legislation similar to regulations already in place in every other high income democratic country of the world - countries in which mass shootings are rare or non-existent and in which overall rates of firearm related deaths and injuries are far lower than in the USA. Such legislation includes stringent regulation, if not complete bans, on civilian ownership of handguns and rapid fire semi-automatic rifles. In order to stringently regulate handguns, we'll first have to overturn the radical reinterpretation of the Second Amendment in the 2008 Heller decision in which a narrow five to four majority of the court reversed over two centuries of legal precedent in ruling that the Second Amendment confers an individual right to own a handgun. 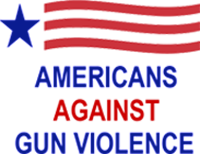 If you agree that we need to take definitive action to stop the epidemic of gun violence in our country, please join us in becoming a charter member of Americans Against Gun Violence by going to the Join/Donate page of this website. The membership fee, which is tax deductible, is just $25 ($10 for students). Of course, an additional tax deductible donation beyond the membership fee would also be helpful. You might ask, "Why join Americans Against Gun Violence when there are many other non-profit organizations already working on the gun violence problem?" We agree that there are currently many good organizations doing excellent work in the field of firearm injury prevention. To our knowledge, though, there is no national organization other than Americans Against Gun Violence that advocates adopting the kind of stringent firearm regulations that are already in place in every other high income democratic country of the world. That's why just a couple of months ago, some colleagues and I decided to start a new non-profit organization that will educate the American public, including policy makers and elected officials, concerning the need to take definitive steps to stop the epidemic of gun violence that afflicts our country. If you explore this website, you'll find that the content is currently somewhat limited. We had planned to develop the website further before opening Americans Against Gun Violence for membership, but in the wake of the horrific Orlando mass shooting, we felt that it would be best to go live with the website in its current limited form and open the organization for membership now in order to provide a constructive outlet for the grief and outrage that many of us feel, not just over the shooting itself, but over the fact that we as a country didn't take definitive action long ago to prevent this kind of tragedy from recurring over and over again. Your membership payment and, if you're able, your additional donation will help us rapidly improve this website and build up our other infrastructure and capacity. Please return to this website frequently for updates. We know that taking on the gun lobby in this country is quite a challenge. When I explain to people that in order to stop mass shootings and reduce rates of firearm related deaths and injuries in the USA to levels at or below those in other high income democratic countries, we'll need to overturn the Heller decision and enact stringent restrictions, if not complete bans, on civilian ownership of all handguns and semi-automatic rifles, they often tell me, "It's never going to happen." I'm sure that some day, it will happen. The only question in my mind is how many innocent people will die needlessly of gunshot wounds before that day arrives. In closing, I'd like to share a quotation from the late Nobel Peace Prize Winner and South African leader, Nelson Mandela, who led the movement to overturn apartheid while spending 27 years in prison, and who emerged to become South Africa's first black president. Nelson Mandela said, "It always seems impossible until it's done." Together, we can stop the epidemic of gun violence that afflicts our country. I hope you'll join Americans Against Gun Violence in getting it done.